The T-square (Figure 2-6) gets its name from its shape. It consists of a long, straight strip, called the blade, which is mounted at right angles on a short strip called the head. The head is mounted under the blade so that it will fit against the edge of the drawing board while the blade rests on the surface. T-squares vary in size from 15 to 72 inches in length, with 36 inches the most common size. The head is made of hardwood, the blade usually of maple with a natural or mahogany finish. The edges of the blade are normally transparent plastic strips glued into grooves on both edges of the blade. 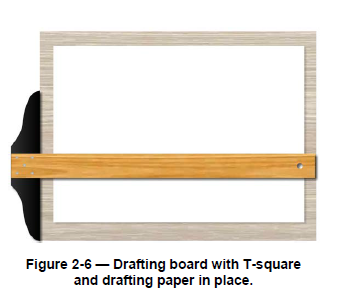 This feature allows the edge of the T-square to ride above the drawing as the blade is moved up or down the board. This arrangement is a great advantage when you are drawing with ink. Since the tip of the ruling pen does not come in contact with the blade, but is below it, ink cannot be drawn under the blade to blot the drawing. The T-square is used for drawing horizontal lines only. Always draw lines along the upper edge of the blade. The T-square also serves as a base for drawing the vertical and inclined lines of a triangle. Some T-squares have adjustable heads to allow angular adjustments of the blade. Handle your T-square carefully. If dropped, it may be knocked out of true and become useless. Additionally, to prevent warping, hang the T-square by the hole in the end of the blade or lay it on a flat surface so that the blade rests flat. Before beginning a new job, check the top edge of your T-square for warp or nicks by drawing a sharp line along the top of the blade. Turn the T-square over and redraw the line with the same edge. If the blade is warped, the lines will not coincide. If the blade swings when the head is held firmly against the edge of the drawing board, the blade may be loose where it is joined to the head, or the edge of the T-square head may be warped. You can usually tighten a loose blade by adjusting the screws that connect it to the head, but if it is out of square, warped, or in bad condition, select a new T-square.